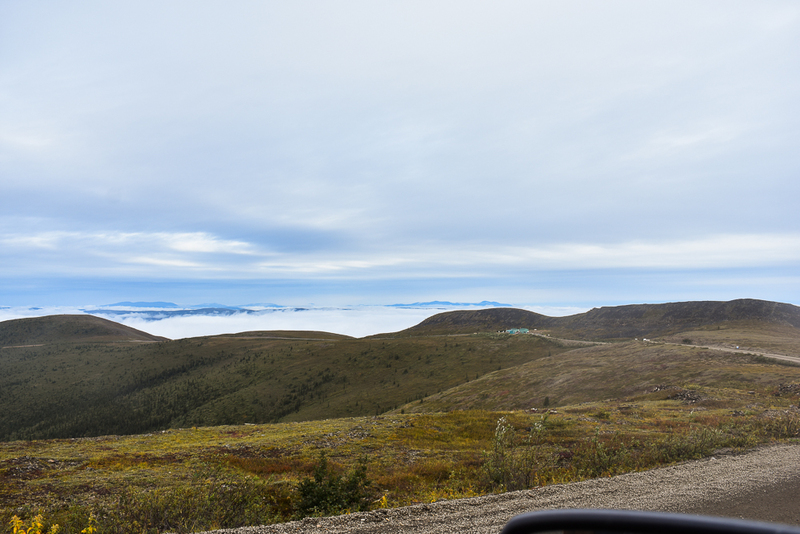 We left Dawson City, Yukon and headed off across the Yukon River to the top of the world highway. So fondly named this way because you climb so high into the mountains of this region that you quite literally feel like you're on top of the world. I now have no questions about what heaven looks like. This stretch of road was 127 km of unpaved, bumpy gravel with lots of stunning views and the possibility to see Caribou. 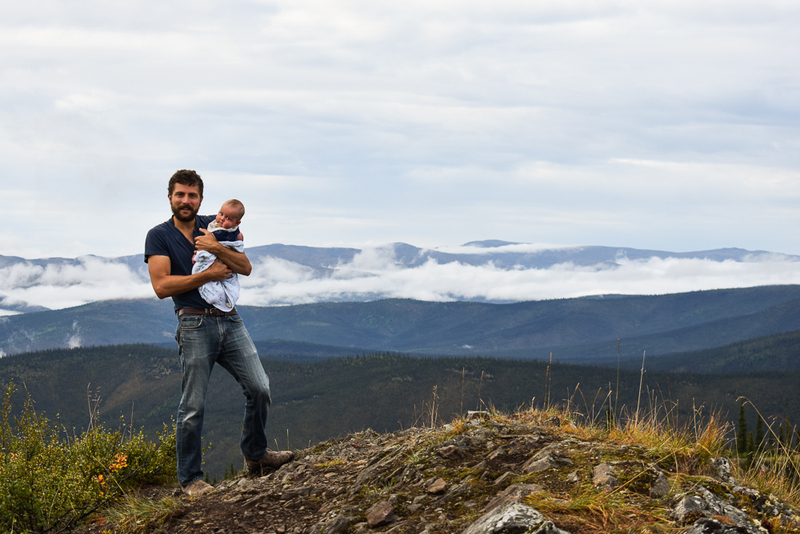 It was pretty clouded in when we drove through so we missed out on the Caribou, but we definitely stopped several times to take in the views. Seriously though, such a beautiful stretch of road between Canada and the U.S. Also, that little green dot on the road ahead in the above photo....that's U.S. customs/border. That's it. And yes, there are border guards working there....they do 2-3 month stays at a cabin on site. We then headed south through sleepy little Alaska towns like Chicken (definitely stop here if you can...it's just funny). Chad seriously thought Chicken was going to be a cute little town with some sort of main street. It's quite literally a single souvenir shop with the only flushable toilet in town. We also passed through/camped in Tok, Alaska, which is a good spot to stock up or head back into the Yukon if you're looking for a shorter road trip. From here we travelled straight south to Valdez, AK. Known as the waterfall capital of Alaska, Valdez boasts some stunning views and is predominantly a commercial fishing port. We stayed at this cute little RV Park called Bayside RV Park. It put us within walking distance of the marina where you can go and charter a fishing trip or watch folks coming in with their catch at the end of the day. 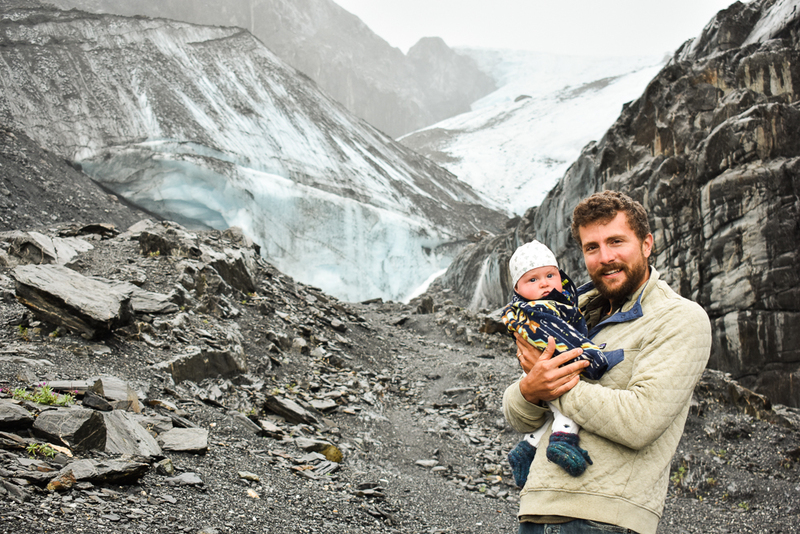 On our way into Valdez, we stopped at the Worthington glacier that boasts two beautiful hikes up to either the toe of the glacier or a ridge hike to look over the glacier from above. We just hiked up to the toe with Eli. 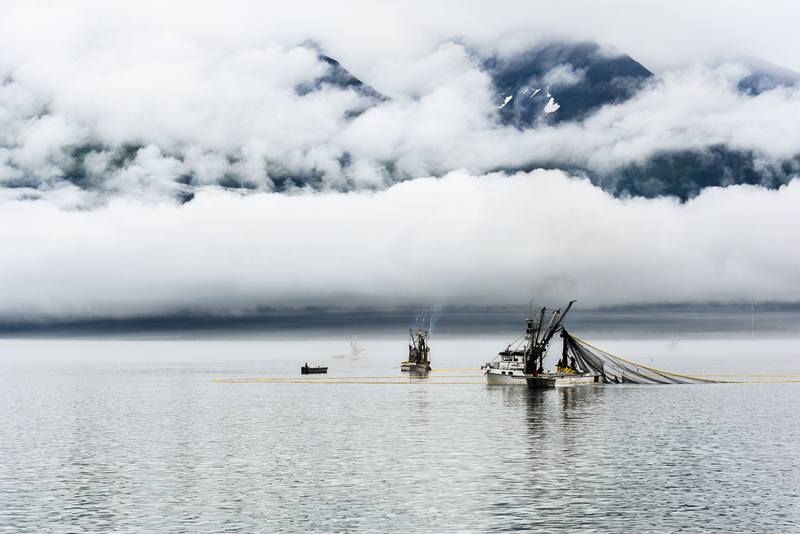 From Valdez, we took a bright and early ferry to Whittier, AK. We didn't stop in Whittier (just drove through - it's super tiny), but the history is crazy. After the Aleutian Islands were attacked by the Japanese in WWII the U.S. army wanted a secret military installation in a relatively inaccessible and ice-free port. Whittier made sense since the 3,500 foot peaks surrounding it brought in a ton of cloud cover hiding it for most of the year. The army then had to blast out the Anton Anderson Memorial Tunnel through solid granite. This tunnel is super long. It gives you a good sense of the span a mountain can truly cover. Oh yeah, its also single lane and has railroad tracks running through. The wait can be long and it's definitely got a dodgy feel to it, but still so cool. Whittier and its tunnel are not super well documented in travel guides for the area, but friends of ours recommended it. We then drove north on the Seward highway towards Anchorage, Alaska. 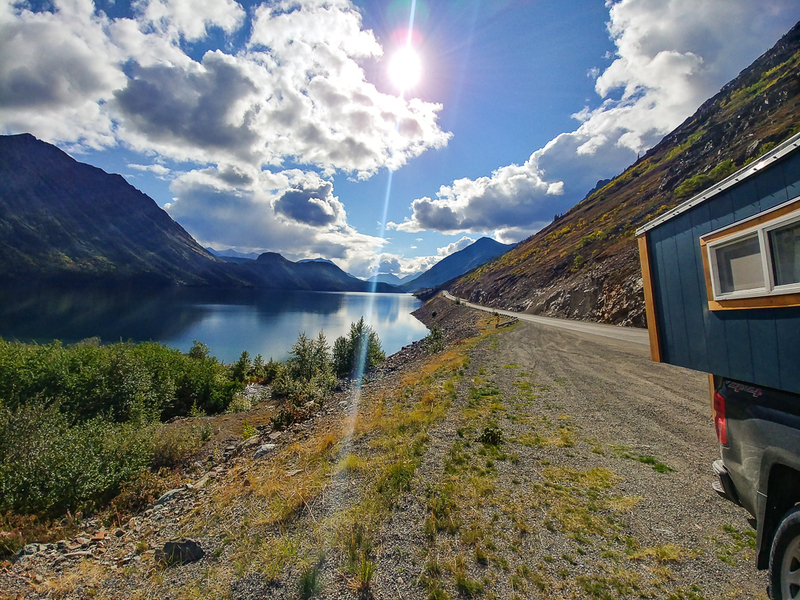 The Seward highway was stunning and we could have spent 2 weeks stopping and hiking all the great trails just off this highway into the Chugach mountains. We were running slightly tighter timelines for this stretch of the trip. Our focus is never usually big cities on road trips so we treated Anchorage more as a recharging spot. We had met a lovely couple on our drive up the Cassiar highway who showed interest in our homemade camper. They invited us to stay at their home in Anchorage when we were passing through. It was a nice reprieve to have a proper hot shower, laundry, and some good home cooked meals. It's not likely that we will see them again, but I will absolutely never forget them for their hospitality. One of the beauties to road tripping is the people you meet. 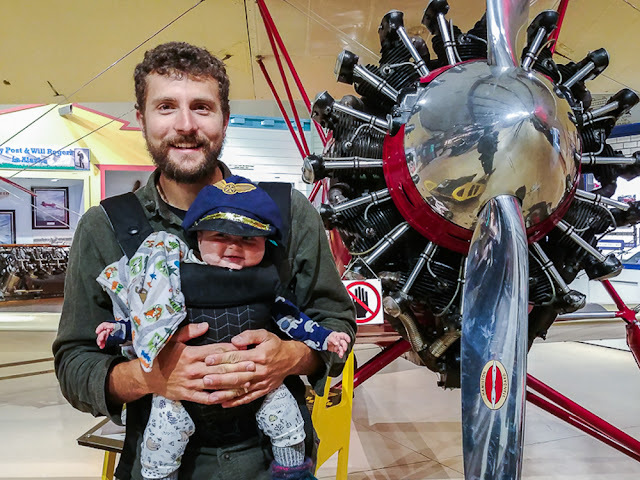 We did spend a day though checking out the city and found a great downtown cafe, stopped at a good butcher shop, and spent a couple hours at a very cool aviation muesum. I learned so much about Alaska's experiences in WWII and the history of bush planes in Alaska. Did you know that the driveable area of Alaska relative to the size of the state is actually the size of a postage stamp (driveable area) on an 8 1/2 x 11 piece of paper (state of Alaska)?! Crazy. 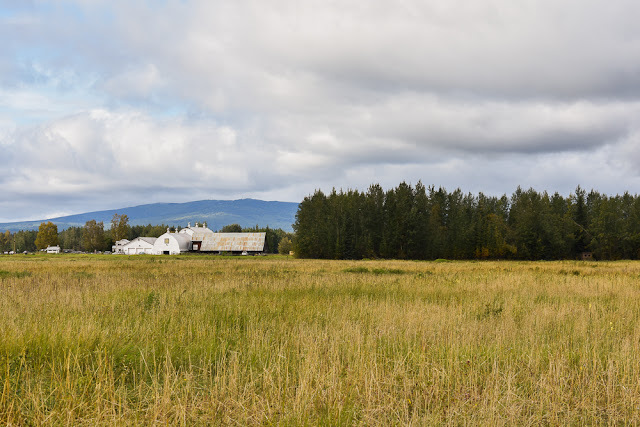 We said our goodbyes to our lovely hosts and headed north towards Fairbanks stopping in Talkeetna, Denali National Park, and at the Alaska County Fair. If I'm being honest, Denali was a bit of a let down. There is some serious hype around this national park and yes, it is beautiful. However, it reminded me of other national parks that are overly hyped up and a small village or town ends up developing at the base of some beautiful mountain or iconic natural site. Kind of like Banff or Whistler. Such beautiful places and the villages/towns are pretty neat in the sense that you can eat, shop, and stay in such a pristine natural landscape. So if that's your thing then maybe you'll totally love Denali. However, the little village near Denali is like a small shopping area with some lodges right off the highway. The road into Denali is only accessible by a bus that takes you into and out of the park and I believe there is a fee for this bus, but I could be wrong. We did find some pretty spectacular hikes a little ways up or down the highway from Denali and they are relatively well marked. So if you're doing Alaska on a shoe string like we were, there are other options. You just have to look for them. If you ever get the chance to go to any State Fair, I highly suggest that you do. 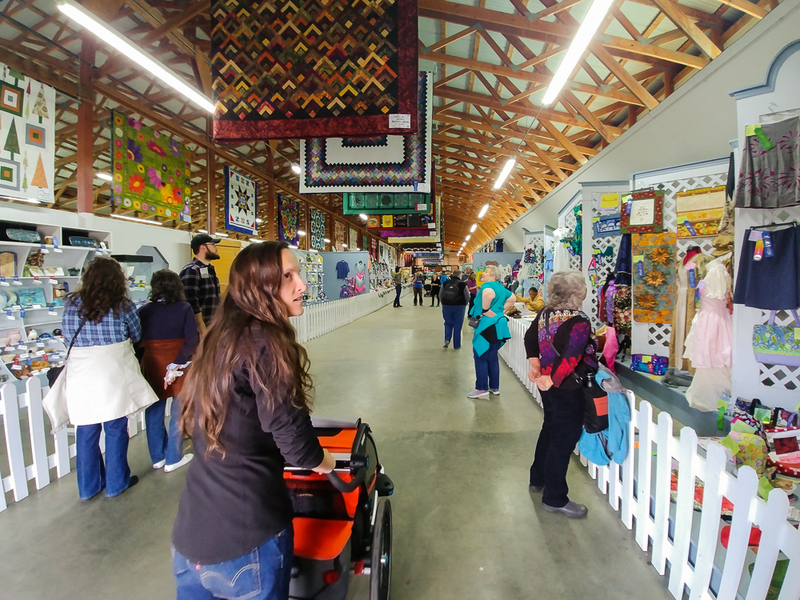 We have fall fairs in the areas of Canada I've lived in, but nothing matching the size or caliber of the Alaska State Fair. It was incredible! The submission and ribbon selection covered every handmade and hobbiest craft you could possibly imagine. It was intense. We sat through a pig race and bet some quarters at a rat race table with a live mouse. I feel like I was in some all-american movie or something. It was surreal. From here we continued on north to Fairbanks. Fairbanks, Alaska was a little underwhelming. Maybe it was the time of year we were there (late August) with evening and morning temperatures dipping below 0 degrees Celsius already and lots of rain. It's definitely a city and a good place to fuel up, but tourism may not be their highest priority. There was a cute little heritage village called Pioneer Park that showcases some of Fairbanks history with a few cute shops to grab a hot drink or a souvenir. The Wedgewood Wildlife Santuary and the Creamer's Field Migratory Waterfowl Refuge are both great to check out in a single day trip if you're looking for an easy, and family friendly walk. 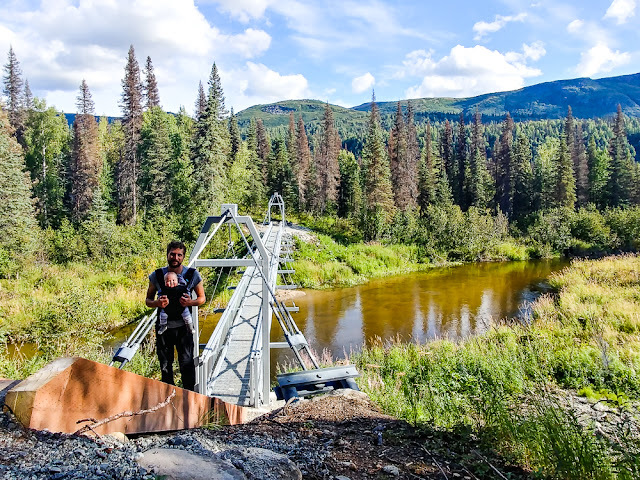 I got the impression that Fairbanks is your place if you're chartering a plane or taking on some great northern outdoor adventure that may require an outfitters or guide. The city itself wasn't super impressive, but by no means I place I would have wanted to brush past. We made a very brief stop in North Pole, Alaska just south of Fairbanks and I will never forget it. Maybe its my obsessive love for Christmas, but this was a major highlight for me. It's where we were able to get Eli's Christmas picture with Santa...in August. 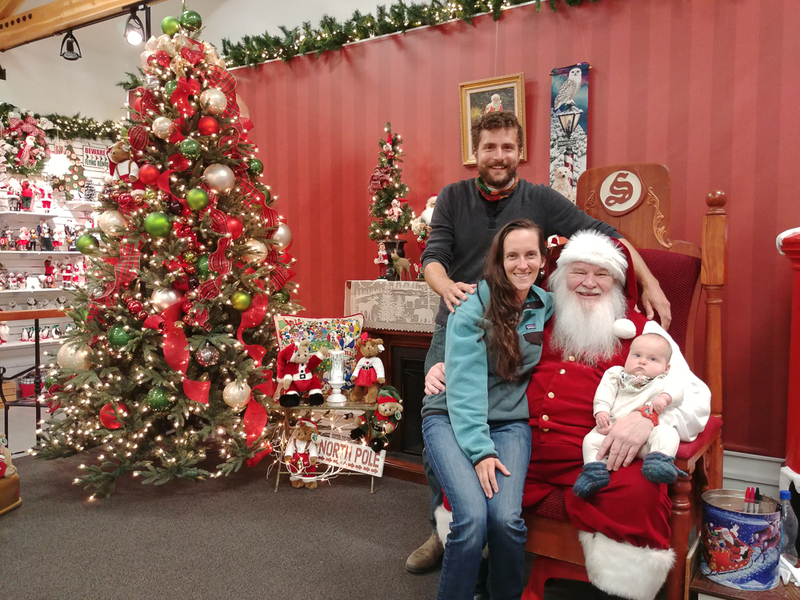 We stopped at a huge Christmas store that sold literally every Christmas thing you can imagine. We spent the night at the Chena River State Recreation Area and headed out the next morning across scenic Alaska and back into the Yukon. 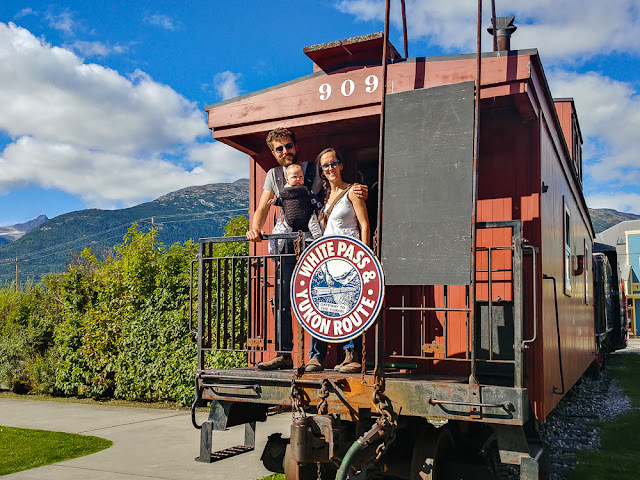 After spending some time back in the Yukon, we were planning on heading south back into northern BC and towards the Rockies, but when we passed the signs for Skagway, AK and figured out that it was only a 1 1/2 hour trip to get there, we had to detour and add another night to the trip. 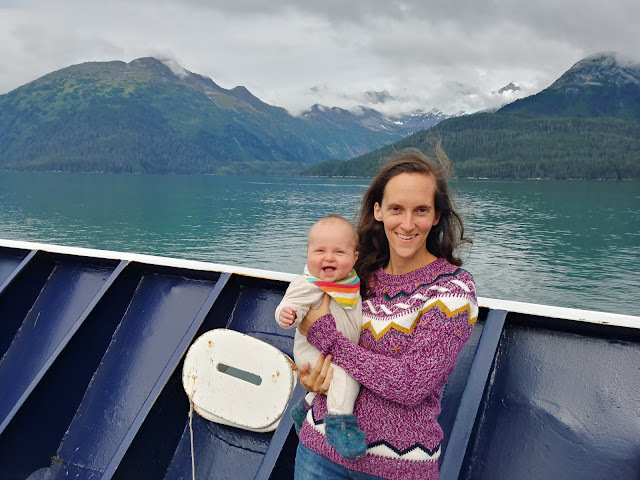 We've been to Skagway before, but on an Alaskan cruise, so it was really neat to drive into the town since we had already been there by sea. And this drive was easily the most beautiful of the entire trip. In Skagway, you can also hop on the White Pass train which takes you through the deep valley that links Skagway to the Yukon where the road comes in to Skagway. It was spectacular. We loved Alaska with only a few regrets, but mostly being that we really just wish we had more time. 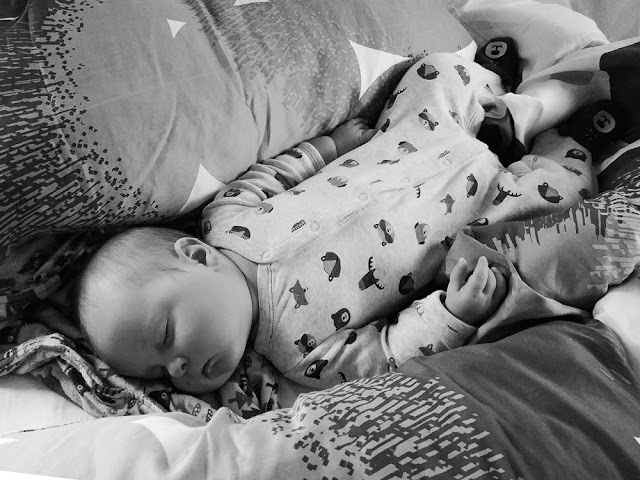 We may come back when Eli is older to do some venturing further a field and getting into some National Parks that were either relatively inaccessible or just not an easy trip in with a baby. Our main focus though was just having a long and fun camping trip with some light hikes and lots of sightseeing. I highly recommend Alaska as a vacation spot, but definitely as a road trip. The state is just far too big to spend it in one area and then walk away saying you've 'seen' Alaska.